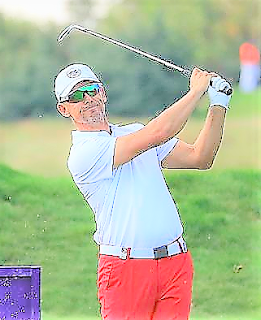 Magnus P Atlevi tamed the blustery conditions on Day One of the European Tour Properties Senior Classic by posting a five under par 66 to take a first round lead at Lighthouse Golf and Spa Resort in Bulgaria. Scoring proved to be difficult in the windy conditions but Atlevi posted an excellent 66 to sit one shot ahead of Peter Baker and Stephen Dodd, who share second place on four under par. After his place at the top of the leaderboard on Day One was confirmed, Atlevi was delighted with a round which he admits was difficult from start to finish. “It was good,” Atlevi said. “It was really difficult in this strong breeze. Every shot is difficult actually; downwind, crosswind, wind against, so I’m very happy. “I’m very happy and as always, when it’s as windy as this, you end up very far from the pin sometimes. My long putting was the key to not dropping too many shots today. “I don’t so much like the windy conditions but I don’t mind it. I was brought up playing in these types of conditions, as were many British and Irish guys. The 53 year old Swede's last Staysure Tour victory was at the 2016 Paris Legends Championship and the possibility of adding to that triumph this weekend is something which whets the Swede's appetite. “Even though we don’t have a cut, it’s always nice to see your name on the leaderboard,” he said. “When that happens, you really start to feel like you’re really competing, which is what we want to do. Welshman Dodd carded eight birdies on Day One in Bulgaria but a pair of bogeys and a double on the 17th meant he was forced to settle for a share of second alongside Baker on four under. A shot behind the duo in second place are Stephen Bennett, Gary Marks, Mauricio Molina and Mark Wharton on three under par. André Bossert and Peter Fowler are a shot further back on two under par, while a group of ten players are on one under par.